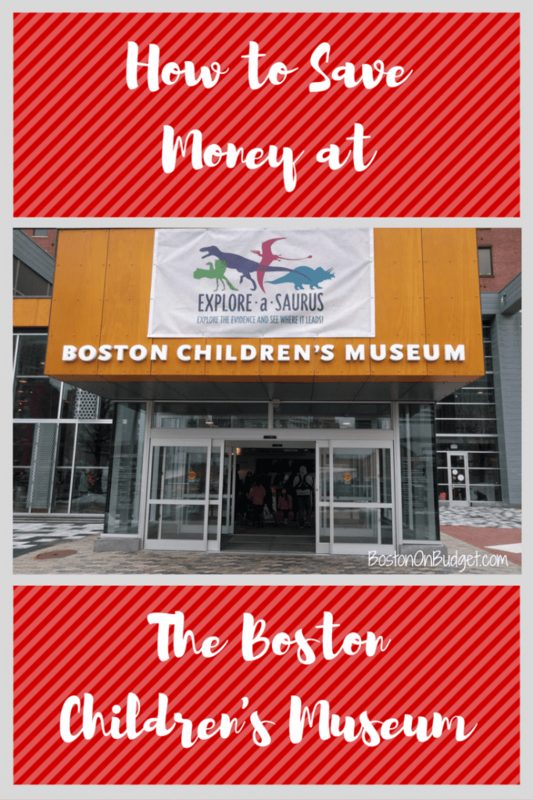 Are you looking for ways to save at the Boston Children’s Museum? The Boston Children’s Museum is located at 308 Congress Street in Boston. Tickets are $16 per person and children under 1 are FREE. Members are admitted free and basic membership is $160 for a year and admits 4 people per visit as well as other perks including free and half-price admission to other museums. Membership may be a good option for you if you frequent the museum often, especially for a family of four! There are a lot of different ways to get to the Boston Children’s Museum. South Station is located less than half mile walk to the Boston Children’s Museum and is a great budget-friendly option, especially if you don’t want to drive to the museum. Take the red line, silver line, bus, or commuter rail to South Station and walk over the Congress Street Bridge. Price varies depending on travel method, but children 11 and under ride free on the subway and commuter rail. If you’d rather drive directly to the Boston Children’s Museum, there are some parking lots close by. Weekend and Friday night parking is going to be cheaper because you don’t have to compete with commuters for parking spots. Farnsworth Street Garage: $24 on weekdays and $14 on weekends, need validation at museum info desk for price (NOTE: This is the garage we parked at and noticed the $14 sign for parking out front, so I don’t think you’d need the validation sticker if the sign is there. We used SpotHero to reserve a spot at the garage and it was $10 through the app). There is also an open parking lot right across the street from the Children’s Museum (321 Congress Street) and it looks like parking is $15 on the weekends and $25 max on the weekdays, but I would probably double-check that before you pull in. If you are looking for more parking options and/or the cheapest parking lot, I highly recommend downloading a parking app on your phone. You can see the real-time parking rates for the day/hours of your visit and the current availability. Sometimes you can reserve in advance and get a discount. Depending on the garage and parking app, you may need to follow a special direction to get the ticket validated. For the Farnsworth Garage, I needed to bring my ticket with me, and then go to the main office (right by the elevator) to show my parking app to get the ticket validated by a staff member and then I slipped the ticket into the machine on my way out. Overall, parking apps are a great way to find the cheapest parking garages in real-time without spending extra gas. An extra bonus if you have any free credit with them to apply to your parking costs! The closest dining option is at the Children’s Museum, which is Au Bon Pain. There is an entrance on Congress Street, but you can actually access the bakery through the Museum too as there’s an entrance on the first floor. There’s a lunch area on the first floor, and this is the only area where food is allowed in the museum. You can also bring food as well and eat it there, if you’d rather. In the summer, you can eat on the patio outside and you can also purchase food from the Hood Milk Bottle if you want. It was cold and closed when we went, so I’m unsure of the prices. South Station Food Court: If your looking to keep it casual and quick and took the train or bus to/from the museum, you may want to eat at South Station. There’s a lot of different options and most are too expensive either. Food Trucks: Also, super casual and near South Station, head to Dewey Square for some t0-go eats from a food truck. Here’s the Greenway Food Truck schedule. Pastoral: Pastoral is a great option for Pizza and sit-down service located a quick walk from the museum, on the other side of the street if you are looking for a sit-down option. Even better, show your museum admission receipt for 10% off! Flour: Flour is a bakery + café across the street from the Farnsworth Garage and a great spot for casual counter service and delicious treats. Boloco: There is a Boloco at 284 Congress Street if you are looking for counter service and burritos. Even better, download the Boloco Passport App for $5 off for new users. You can even order and pay ahead of time through the app. (Note: You’ll want the Atlantic Wharf location on Congress St., not the Children’s location which is Children’s Hospital on Longwood. It just sounds like something I’d do when I’m sleep deprived and in a hurry, so figured I’d make a note). Shake Shack: Shake Shack is located at 77 Seaport Blvd and is about a 5 minute walk from the Museum. Shake Shack is counter service with burgers, shakes, and more, and you order your meal ahead of time with the Shack App available on iOS. I recently went to the Children’s Museum in Boston with my little one (2-year old) and husband and we spent $24 total on tickets and parking, not including the cost of gas. We got discount tickets through the Boston Public Library and received half-off admission per person, and paid $24 for admission. I accidentally let my BPL card expire (it expires every two years) and realized when I tried to reserve a pass in advance. Instead I went to the library on the way to the museum, renewed my library card and picked up a pass right there. I was in and out of the library in 5 minutes or less and was an easy way to save $24! We ended up driving to the museum and parking at the Farnsworth Garage. Weekend parking is $14, and we had no trouble finding a spot. I have the SpotHero app on my phone and reserved a spot on the way in (ok– when we parked) and parking was $10 through the app. I also have awesome readers who used my referral code in the past so I had $10 in credit that paid for parking! Food and beverage is only allowed in the lunch area located on the first floor. The lunch area is attached to Au Bon Pain so you can grab food there and bring it to the lunch room without leaving. We ended up giving our son a quick snack that we brought from home in the lunch room and continued to explore. He had a little injury later so we ended up eating lunch at home instead of going out to eat after. However, there are a lot of restaurants nearby if you do want to eat before or after your visit. My little one had a good time but it was BUSY on a Saturday (mid-morning) in March on a rainy day. I’d probably go on a weekday in the future to hopefully avoid some crowds. Have you been to the Boston Children’s Museum before? Do you have any tips to share? *This post contains a few referral links where I get credit if you sign up for a service. Please see my disclosure policy if you have any questions.